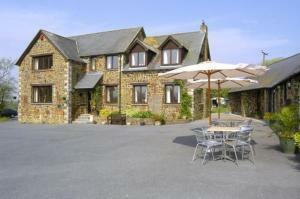 Welcome to our page of bed and breakfast in Okehampton! Okehampton provides a wide range of facilities in an beautiful setting, with easy access to both north and south coasts & Dartmoor. To the north is rural Devon, with Exmoor beyond. The town provides a wide range of sports facilities in Simmons Park. There is also a heated, indoor Swimming Pool. Okehampton holds a general market every Wednesday to Saturday in the Market Hall. Okehampton Castle is half a mile southwest of the town centre. If you are in the right town but cannot find the accommodation you want on this page, you might consider Okehampton hotels & self catering accommodation in Okehampton. Also see Okehampton & Okehampton attractions. For bed and breakfast in other areas near to Okehampton see bed and breakfast in Torquay & bed and breakfast in Newton Abbot.